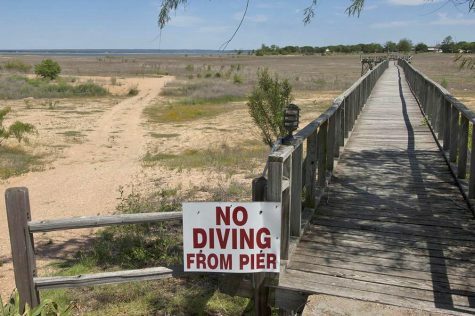 Lake Buchanan, Central Texas, Drought 2011. Though generally, rainfall only bounced to record low levels once, there were several pulses (2003, 2007, 2009) where inflows to the lakes were at record lows. by very large margins. Partly due to more lakes upstream, apparent drought, where more evaporation and water use by plants during warmer times create drier sols, so that when it rains, more water soaks in and less flows off. This created apparent drought conditions more severe than comparable times when rainfall was similar. This research from Princeton, University of Southampton and the US Geological Survey does something novel, or that hasn’t been done yet. 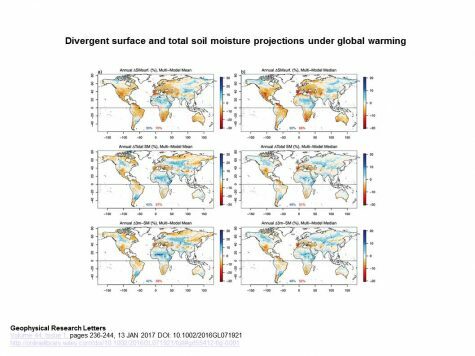 They pulled together 25 global climate models and looked at soil moisture from the 1979 -2005 and then out to 2100 in soils down to 10 feet deep, not just surface soils as our current society relies upon. What they found was as predicted previously with a caveat. There is significant surface soil drying globally, but in some areas, the extra precipitation allows deeper soils, that mainly trees rely upon, to become a bit wetter. There is still a fatal flaw in this and almost all other climate science: extremes. Mostly, we cannot yet accurately predict extreme weather pulses, only annual averages. This is the creator of the gargantuan myth that climate models are inaccurate. Weather models predict the weather for a certain day, and they are accurate only out to 5 days about, or a couple of weeks with less accuracy or seasonally with even less accuracy. Climate models average all of those highly variable weather model results together to get long term averages. When all of the wrong daily weather forecasts are averaged together like this, the prediction of future average weather becomes quite accurate. Climate models then are vastly different from weather models in that they do not predict weather on any given day, and they are highly accurate. So this fatal flaw deals with extremes. Average drying is important, but it is the extreme drought pulses that kill. This is easy to visualize with extreme drought and parched shriveled plants shimmering in the hot dusty wind. They are dead and aren’t coming back. But trees and other long-lived species react differently. Some trees are killed outright by drought, but others survive. What we don’t see going on is that tree’s deep roots matter. In extreme drought pulses, root hairs singe off. It is these tiny hairs that are responsible for most water uptake by plants and they grow incrementally every year just as more and more leaves are put up into the air. On the left, a) is the median or average. On the right b) is the median or middle. Neither of these reflect the extremes. Though meaningful, with the ancient ecologies of our world, it is the extremes that matter most. From Berg et al., 2017. The long term stress effects of drought are impressive. Forest health research from Central Texas in 1990 shows that trees were likely (at the time) still being influenced by stress from the drought of the 1950s. This stress manifests itself in increasing tendency to be attacked by insects and disease, which increases mortality beyond “normal.” What results is generally referred to as “desertification,” but in time frames that matter for most of us, it will be continued ecological chaos as old weak individuals die off, and as time goes by, more and more of the stronger younger of the species succumb until at some point an entirely new assemblage of species has taken over. For example: Every time we have an extreme drought pulse, more old trees die. If a 300 year old tree dies, it’s likely that that drought hasn’t happened in 300 years. But when all of the old trees die, it’s up to the young. It takes an increasingly extreme drought to kill the young of a species because they are more vigorous. So ecological zones will appear to struggle onward for a time, as the average age of individuals gets younger and younger, with the remains of their fallen comrades arranged in disarray all around. Until at some point, an extreme pulse simply kills off everything and what grows back is only what can survive in the new much drier ecological zone. We are much closer to this stage of evolution in some areas than others. These areas are generally those where apparent drought is the greatest. Apparent Drought: drought that occurs when precipitation is normal or above normal. It occurs because evaporation and evapotranspiration (plant’s use of water) is nonlinear greater on a warmer world. In other words, a little warming means a lot more evaporation and evapotranspiration.